When New Yorkers think of Irish playwrights, they might think of Beckett, Synge, McPherson, MacDonagh. Maybe even Shaw or Wilde. 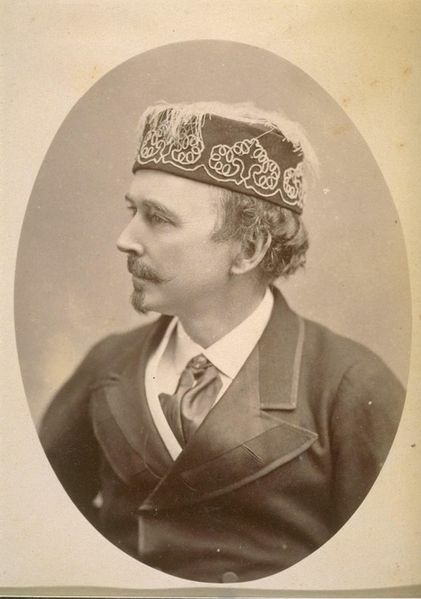 But not too many other than real theatre buffs would say Dion Boucicualt— though the nineteenth century writer’s Irish plays were hugely popular in New York. The Irish here are as corny and sweet as any Disney peasants; the lyricial praises flow; ther’e song and dance and wit, too. The Storm Theatre’s production of Arrah-na-Pogue, set during the aftermath of the 1798 uprising , runs through April 2– and Irish Repertory Theatre opnes The Shaugraun on April 21. I spoke with Dobbins about Boucicault on the podcast this week! 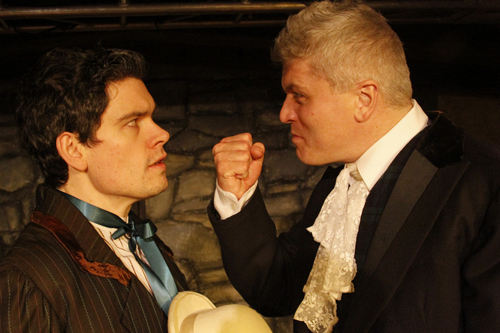 Dobbins loves Boucicault– he’s done Arrah-na-Pogue before; I reviewed the Storm’s second production of The Shaughraun for Back Stage in 2008, read it here). Dobbins has a sure hand with his large cast– the action never flags, the jokes land, and though he doesn’t have the spectacle Boucicault craves (hard to do a dramatic prison escape in the basement of the Theatre of the Church of Notre Dame), he gives us the dance and song. Song? Why, “The Wearing of the Green.” The patriotic song is in the play– Boucicault wrote some new anti-English lyrics for the ’98 ballad, and copyrighted them!). …his popular Irish plays– The Colleen Bawn, The Shaughraun, and Arrah-na-Pogue– not only presented an amusing stage Irishman to confound the English, but an idealized stage Ireland to console the homesick. Like any good sweeping romantic drama, the plot of this play is fairly complicated, and somewhat beside the point, which is to show characters displaying sacrifice, wit, defiance and nobility. Essentially, we learn early on that pretty Arrah Meelish (Nicola Murphy), also known as Arrah-na-Pogue, or Arrah of the kiss, has been concealing her foster brother Beamish MacCoul (the MacCoul, played by Jonathan Blakely) from the redcoats as he prepares to flee to France. Arrah is about to marry her sweetheart, lovable, and not as dumb as he makes out Shaun the Post (Phil Mills, in a role originally played byBouicault). But sneaky Michael Feeny (Paul Nugent), a process server, wants Arrah for himself and rats her out by revealing that she’s holding stolen money (via Beamish). 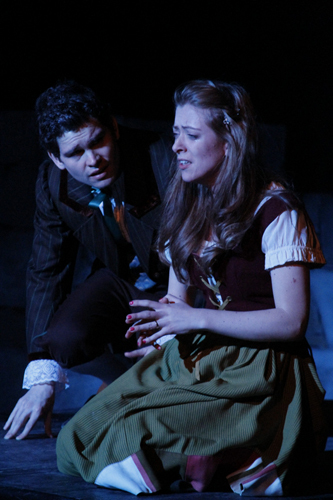 Beamish’s jealous sweetheart, Fanny (Christine Bullen), is beloved by the O’Grady (Ted McGuinness), believes the worst. But Shaun claims he’s the thief, which leads to a hilarious trial (that famously inspired Shaw for his play The Devil’s Disciple) with a potentially tragic outcome. 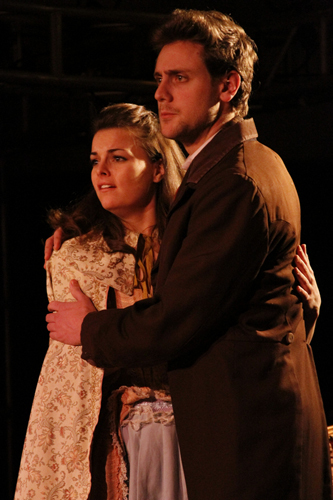 Murphy’s Arrah is sweet and saucy, and she’s matched by Mills, who plays Shaun as an uneducated heroic leading man. Bullen’s Fanny looks pretty but her whining lacks charm. It’s also hard to care a lot about Beamish– it’s a fault in the play, but Blakely doesn’t fill out the cardboard rebel much. But Ted McGuinness as the O’Grady consistently delights, especially when he’s rebuking the English on their manners, while still managing to work with them. “I’m for letting him off,” he tells the other judges. Why? “The eloquence of his defense.” A very Irish reply, and McGuinness delivers it with perfect timing. Paul Nugent’s Michael Feeny, hunched over so that he literally scrapes, hams it up as a pathetic villain, cringing “Captain, dear,” when he’s frightened. Spencer Aste also does well as Oiny, one of Beamish’s men, and Anthony Russo’s English Sergeant had deadpan decency. Laura Taber Bacon’seye-pleasing period costumes add to the feeling of charm and nostalgia, as does the traditional music in the score (though I did hear “The Morning Dew” once too often). Michelle Kafel croons “The Wearing of the Green” so one wishes for even more music (it’s called for in the script!). and Jennie McGuinness’ unexpected stepdance at the wedding is an unexpected treat. While not a fully professional production, there’s style and heart thanks to Dobbins, and it’s well worth the trip uptown. Arrah-na-Pogue was rapturously received in New York, and Boucicault became an American citizen in 1873. He’s even buried in Hastings-on-Hudson. It’s high time for a New York comeback. This was a great adventure to be able to watch. I really enjoyed it. Your postings are very helpful on finding a new experience now and again.